A few months ago I received an email from a prospect researcher working for a prominent theatre company. He wanted to learn how to do data mining and some basic predictive modeling, and asked me to suggest resources, courses, or people he could contact. I didn’t respond to his email for several days. I didn’t really have that much to tell him — he had covered so many of the bases already. He’d read the book “Data Mining for Fund Raisers,” by Peter Wylie, as well as “Fundraising Analytics: Using Data to Guide Strategy,” by Joshua Birkholz. He follows this blog, and he keeps up with postings on the Prospect-DMM list. He had dug up and read articles on the topic in the newsletter published by his professional association (APRA). And he’d even taken two statistics course — those were a long time ago, but he had retained a basic understanding of the terms and concepts used in modeling. There are three required elements for pursuing data analysis. The first and most important is curiosity, and finding joy in discovery. The second is being shown how to do things, or having the initiative to find out how to do things. The third is a business need for the work. My correspondent had the first element covered. As for the second element, I suggested to him that he was more than ready to obtain one-on-one training. All that was missing was defining the business need … that urgent question or problem that data analysis is suited for. Any analysis project begins with formulating the right question. But that’s also an effective way to begin learning how to do data analysis in the first place. Knowing what your goal is brings relevance, urgency and focus to the activity of learning. Reflect on your own learning experiences over the years: Your schooling, courses you’ve taken, books and manuals you’ve worked your way through. More than likely, this third element was mostly absent. When we were young, perhaps relevance was not the most important thing: We just had to absorb some foundational concepts, and that was that. Education can be tough, because there is no satisfying answer to the question, “What is the point of learning this?” The point might be real enough, but its reality belongs to a seemingly distant future. Now that we’re older, learning is a completely different game, in good ways and bad. On the bad side, daily demands and mundane tasks squeeze out most opportunities for learning. Getting something done seems so much more concrete than developing our potential. On the good side, now we have all kinds of purposes! We know what the point is. The problems we need to solve are not the contrived and abstract examples we encountered in textbooks. They are real and up close: We need to engage alumni, we need to raise more money, we need, we need, we need. The key, then, is to harness your learning to one or more of these business needs. Formulate an urgent question, and engage in the struggle to answer it using data. Observe what happens then … Suddenly professional development isn’t such an open-ended activity that is easily put off by other things. When you ask for help, your questions are now specific and concrete, which is the best way to generate response on forums such as Prospect-DMM. When you turn to a book or an internet search, you’re looking for just one thing, not a general understanding. You aren’t trying to learn it all. You’re just taking the next step toward answering your question. Acquiring skills and knowledge will be a natural byproduct of what should be a stimulating challenge. It’s the only way to learn. A couple of weeks ago I shared some early results from our calling program that showed how very high-scoring alumni (for propensity to give by phone) can be counted on to give, and give generously, even after multiple attempts to reach them. If they have a high score, keep calling them! Yes, contact rates will decline, for sure. But these prospects are still likely to give if you can get them on the phone, making the extra effort worthwhile. For the other three-quarters of your prospects, it’s a different story. You may still want to call them, but keeping those phones ringing all year long is not going to pay off, even if you have the luxury of being able to do so. Almost 38% of 10th-decile alumni who were contacted on the very first call attempt made a pledge. 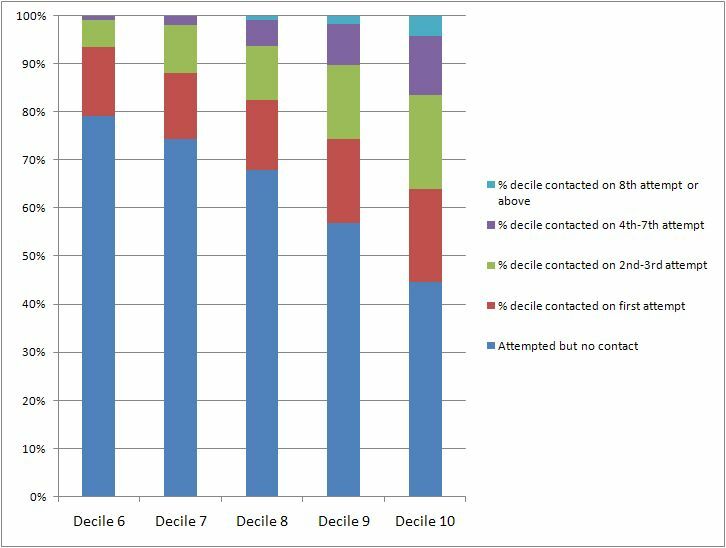 Moving to the next dot on the blue line, we see that almost 37% of the 10th-decile alumni who were contacted on the 2nd or 3rd attempt made a pledge. The pledge rate slips a little more, to 36%, if the prospect picked up the phone on attempts 4 through 7. And finally, almost 26% of them pledged if it took more than 7 attempts to reach them. That’s the first line. The other lines take different paths. The 9s and 8s start much lower than the 10s, but pledge percentages actually rise with the number of call attempts. They will fall back to earth — just not yet! As for the lower deciles, the 7s and 6s, they start relatively low and dwindle to zero. So what does all this tell me? I am less interested in how each decile ranks at the start of calling (one or two attempts), because it’s no surprise to me that the 10th decile gives at twice the rate as the 9th decile, and that pledge rates fall with each step down in the score. I’ve seen that before. What really interests me is what happens when we’ve made many repeated attempts to call. That the 8s and 9s have pledge rates that increase with the number of call attempts is pretty strange stuff, but the fact is: 26 alumni with a score of 9 made a pledge only after we called them 8 or 9 or maybe 15 times. Whether it’s worth it to make that many call attempts is up to you. It depends on contact rates, and what it costs to make all those calls. But one thing is certain: If I’m going to call repeatedly, I’d better be calling the top three deciles, because if I keep on flogging the segments with a score of 6, I’m not going to do very well. So what about contact rates? What does it mean? Compare the lowest decile called so far (Decile 6) with the highest decile (10). About 14% of 6s answered the phone on the first try, compared with about 19% of the 10s. That’s not a big difference: In fact, contact rates are similar across the scores for the first attempt. But the similarity ends there. After the first attempt, the lower scoring alumni have steadily decreasing rates of contact. The same is true of the higher-scoring alumni, but the difference is that some of them are still answering their phones on the 8th call. More than 4% of 10s were reached on the 8th call or greater. The bottom line is, the propensity score is your biggest asset in setting appropriate call attempt limits. Yes, Renewal prospects are more likely to give than Acquisition prospects. But that’s not enough to go by. Are you going to call every last Renewal prospect before thinking about acquiring new donors? I wouldn’t recommend it — not if you care about long-term growth and not just this year’s totals. And because contact rates decline as attempts increase (regardless of score), you’re going to end up making a LOT of phone calls to find those gifts that will make up your goal. My earlier post on the same subject is here. I am spending a lot of time on this, because I don’t see any of this being written about by the well-known experts in Phonathon fundraising. Why that is, I do not know. I tend to hear the same objections from presentation audiences, my own and others’. They’re not objections so much as questions, and very good questions, and always welcome. But no one yet has voiced a reservation that I know some must be thinking: This predictive modeling stuff, it’s all so … impersonal. We already work in a profession that refers to human beings as “prospects” and “suspects”. Doesn’t sticking scores and labels on people perpetuate a certain clinical coolness underlying how fundraising is carried out today? Predictive modeling sounds like bar-coding, profiling, and commodifying people as if they were cattle destined for the table. Maybe we can be so busy studying our numbers and charts that we lose our connection with the donor, and with our mission. Apologies in advance for setting up a straw man argument. But sometimes I imagine I see the thought forming behind someone’s furrowed brow, and wish it would be brought into the open so we can discuss it. So here we go. More seriously: Data mining and predictive modeling will never interfere with the human-to-human relationship of asking for a gift, whether it’s a student Phonathon caller seeking an annual gift, or a Planned Giving Officer discussing someone’s ultimate wishes for the fruit of a lifetime of work. It’s a data-free zone. What predictive modeling does is help bring fundraiser and would-be donor together, by increasing the odds (sometimes dramatically increasing the odds) that the meeting of minds will successfully converge on a gift. Here’s how I frame it when I talk about predictive modeling to an audience that knows nothing about it. If all we know about a constituent is their giving history (or lack of it), we’re treating everyone the same. Is one non-donor just as likely as another to be convinced to make an annual gift? Is one $50-a-year donor just as likely as another to respond to an appeal to double their pledge this year, or be receptive to having a conversation with a Planned Giving Officer? The answers are No, No, and NO! What I say is, “Everyone is an individual.” If they played sports as a student, if they lived on campus, if they attended an event — we can know these things and act accordingly, based on what they tell us about their engagement with our institution. We just have to tune in and listen. “Everyone is an individual.” Catchy, eh? Well, it’s trite, but it’s true — and it’s no less true for data miners than it is for anyone else.